The NFL season may be over, but football gamers can still get their pigskin fix with EA Sports Big’s NFL Tour for the Playstation 3 and Xbox 360. The game replaces the popular NFL Street series and features arcade-style play, huge hits and wall climbs. 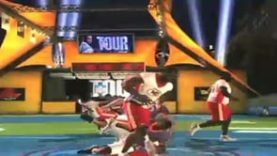 In this episode of The Reboot, host Rio Pesino gives his take on NFL Tour and whether or not the game follows the over-the-top, in-your-face gameplay of its predecessor.